Lenny loves…possibly the best coffee you will every try! It took me 30 years to like coffee, and its opened up a whole new world for me. The discovery happened by accident whilst I was on holiday when I was accidentally given, or accidentally ordered, a iced mocha from the hotel bar. It was just what I needed at that time and I was addicted to them for my whole holiday. Back at home was where the real discovery started, or so I thought. Was I a Costa, Starbucks or a Cafe Nero kinda gal. I whittled it down to not really liking Cafe Nero, I could do Costa, but Starbucks was my favourite. Well that was until I discovered the hidden gem that is Bora Coffee based on the Stratford Road in Shirley. Run by Ross and Danielle, there little baby opened on 24th July date and all started back in 2014 and focuses on their charitable work in Uganda. Ross is a complete coffee geek and their aim is to provide you with ‘ethically sourced, delicious coffee from the African Continent’, and I can certainly vouch, their coffee is delicious. Having driven past their new social enterprise it pipped my interest and I decided to check them out. The coffee shop has a very basic, clean but on trend design where the main focus is the coffee. Their menu is small but concise, and their prices are extremely good considering the quality offering you are getting. On my first visit, I took my sister and boyfriend on Saturday afternoon. When we arrived, it was fairly quiet but it soon got busier. I went for their V60 coffee with the Rwandan blend. V60 is just the way the coffee is brewed. Perfect measures of water are poured over the ground coffee beans, which were freshly roasted only a few days before by their specialist roasters based in bradford. This method takes around 5 minutes to filter but it was worth the wait. Served in a preheated mug (no small cups here) with a talk through demonstration by Ross himself, it was a fascinating process to watch. Once it was ready, it was poured with a little space left for milk. Now, I am normally a milky sweet coffee drinker but I am glad that I tried this coffee without adding anything except a small bit of milk, as it needed no additions. It was perfect. Smooth, balanced, fruity. Just perfect. My boyfriend and sister both went for a hot chocolate, which was also pretty great and came with a nice elephant detail on top. Alongside the drinks, we opted to try a selection of their handmade cakes. My boyfriend and sister both went for the super dark brownie, and I opted for the Pear and Ginger loaf. Both were extremely good and very yummy. I was sad to leave that day, but knew it wouldn’t be long before I would be back, and I wasn’t wrong. Just a few days later I took a few work colleagues there in our lunch break. Me and Hannah, who seems to be my partner in crime for coffee shops, decided to go for the Chemex for 2 and try the Kenyan blend. The chemix looked like something off breaking bad, but again is very similar to the v60 and is another brewing method that Bora coffee offer. Again, there was a little talk by Ross as he was going through the brewing process which took around 6-7 minutes as there was double the amount of liquid this time. The Kenyan blend was a touch stronger than the Rwandan, but again I didn’t feel the need to add any sugar, just a tiny bit more milk. Hannah was very impressed by the geekiness of the whole thing! A visit wouldn’t be complete without another sample of their bakes, so I went for the toasted coconut and dark chocolate flapjack and Hannah went for the cocoa orange bar. The flapjack was lovely, not a sticky lump like a normal flapjack, I could almost get away with saying it was healthy. Hannah informed me that her cocoa orange bar was also delicious. I do have a slight feeling that I am going to become a regular here and only hope that this lovely little social enterprise thrives in its little location in Shirley. p.s. 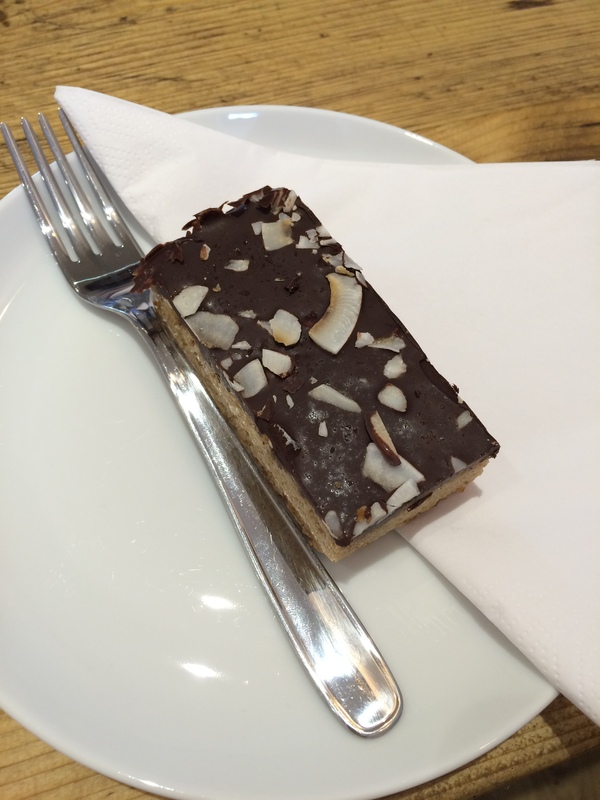 whilst finishing this blog I am currently sat in Bora Coffee for my third visit! Lenny loves…New home, fresh start!